As part of the ongoing "birthday month" of December, I was taken to a very special dinner at The French Laundry by anne, Dave, and Tim. For anyone living under a rock, The French Laundry has been wining awards, hearts, and minds in the food community since 1994 (if my memory serves). I was lucky enough to go there about three months after opening, and this makes my third visit. It was every bit as memorable and wonderful as the first time. It is difficult to talk about The French Laundry and say something that has not been said a million times before. - We got to shake hands with Thomas Keller himself, because he noticed us looking into the kitchen. He just came outside for a brief moment to say hi. 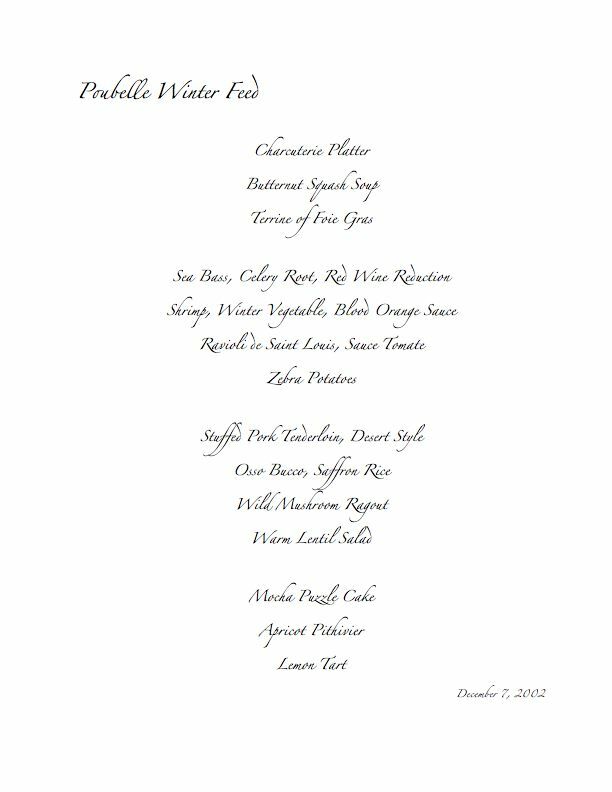 - I was able to have "Oysters and Pearls" (one of The French Laundry's signature dishes) for the first time. 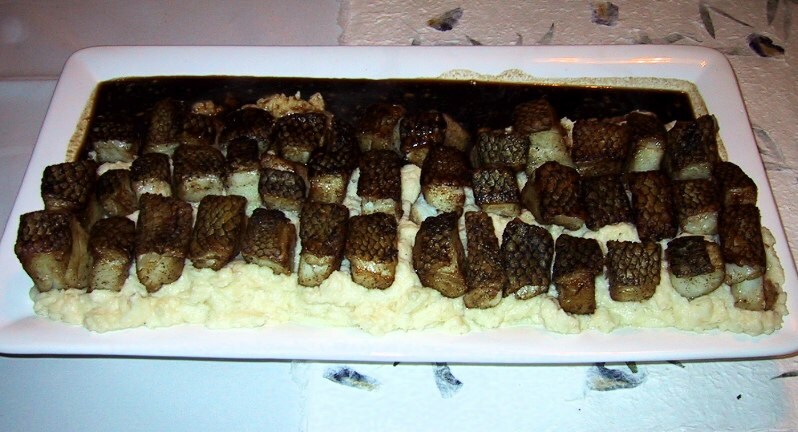 I'm not overly fond of either tapioca or caviar and yet this ranks as one of my favorite dishes of all time! - I was able to wrangle us an extra desert. anne had been wanting "Coffee and Doughnuts" (another signature dish) and didn't have it the first time she and Dave went there. We also noticed that a) it wasn't on the menu and b) another table had it delivered. A few courses before desert, I called over our main waiter and stated that "The young lady is concerned that she did not see 'Coffee and Doughnuts' on the menu." "I'll see what I can do, sir." Tim writes up and provides great photos here. He did an amazing job with low lighting and a tiny camera without flash. You know you've been out of the kitchen for too long, and not writing about it as well when you manage to cut yourself. Sigh. The good news is that work-related fun has tailed off now, so I can get back at it in the kitchen. I have a pile of new ideas for dishes that I need to start experimenting with. Salon as an article about plans for Michelin to start rating restaurants in New York. The end has this great "These Go To 11" quote: "Michelin will have to do a bit of explaining with only three stars at the top; Most of the newspaper reviewers here go up to four stars." I haven't baked bread in a while, and a cold (and foggy) day certainly is the right time to do it. I decided to do a rustic French-style bread, with a "poolish" of fermented dough the day before. Some whole wheat (about 1/8 of the final flour) went into the day-before ferment. I got (what I thought) was a neat idea to slash the rounded loaves into the letter 'P' for "Poubelle", which I thought might turn into a nice bread shape for a future party. Only after I had slashed and baked the loaves did I realize the horrible tresspass I had commited. A round rustic loaf slashed (much more artfully than I could ever do) with a 'P' is the mark of "Pain Poilane", a baker who did much to revive the rustic method of bread baking in France. I was horrified when I realized what I had done. In pennance, I will continue working on my bread. And develop a method of slashing the bread with a small 'p' instead. Crap. I swore up and down I would be in on this one, and had plans, and a new camera, and everything. Alas, events conspired against my entry into the mainstream insanity of Is My Blog Burning. So, I point you to Derrick, the "author" of this event: IMBB 9: Terrines and invite you to check out web chefs both more creative and motivated than myself. California has baned the production and sale of foie gras. Law doesn't kick in until 2012. 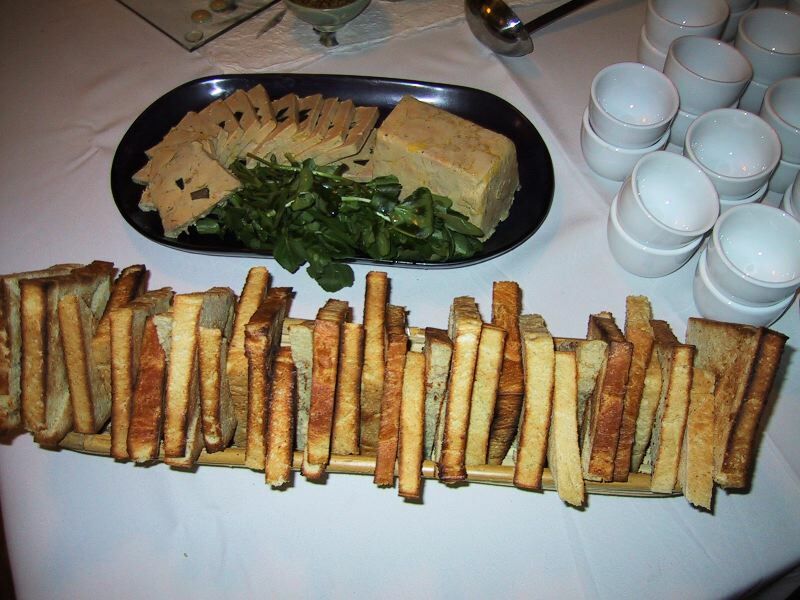 Sonoma Foie Gras (located in CA) is one of two producers in the US, the other is Hudson Valley Foie Gras in NY. Sure to be all over the food blog world today. I can't find any news articles on the web that aren't "yay yay" over the bill. Ah ha! Here's one! Derrick is sure to comment on the subject. He knows far more about the details of it than myself. As is often the case, I decided to keep the deserts under control and made mostly ahead of time. One of these days I'm going to "break out" in full CIA-mode and do something insane...so far, not so much. 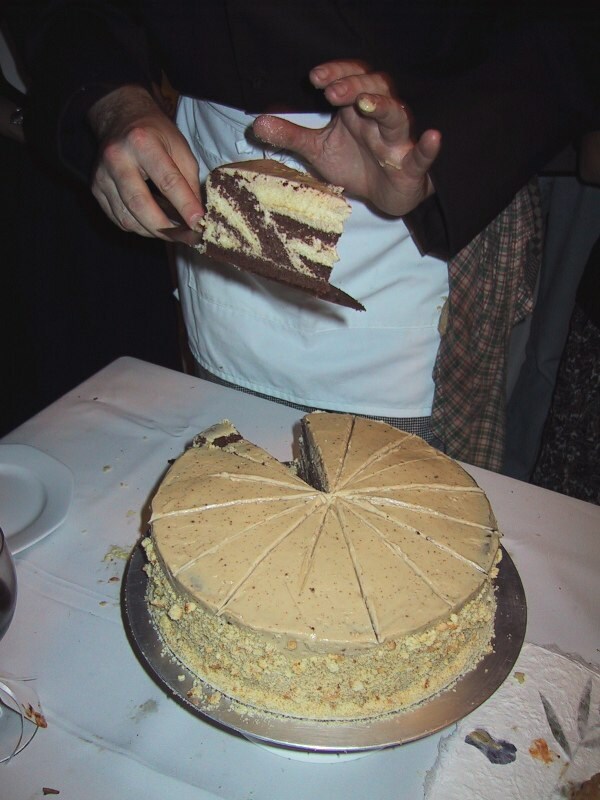 Carol had requested "a dessert with chocolate and rosemary" (two of her favorite things) and so William and I planned ahead a theory -- two desserts, served at the same time, both of which included chocolate and rosemary. With the same ingredients, but differing methods, I dubbed them "Chocolate Rosemary Fraternals" (see previous entries concerning recipe development for the method) More than one clever guest figured out the meaning of "fraternals." 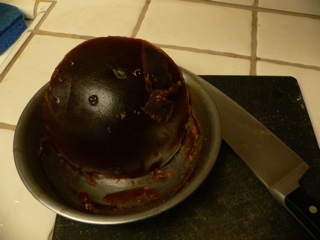 First was a "galub jamun" which had chocolate in the dough, and was soaked in a rosemary syrup (made the day before and re-tossed in the syrup shortly before service). Second, a rosemary cream puff filled with an egg-heavy chocolate mousse (made well in advance and kept cold until about three hours prior to dessert time). Except for the addition of the rosemary, the cream puffs and mousse are Straight Outta Julia. 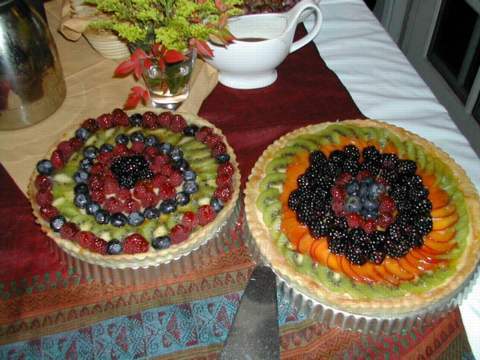 I really enjoy making fruit tarts. Fairly easy to do, and quite impressive looking. I made the crusts the day before, as well as the pastry cream filling. I baked the crusts early in the morning and filled the tarts. A light glaze of apricot and placing them in a cool room let them stay in fairly good shape with a minimum of worry. 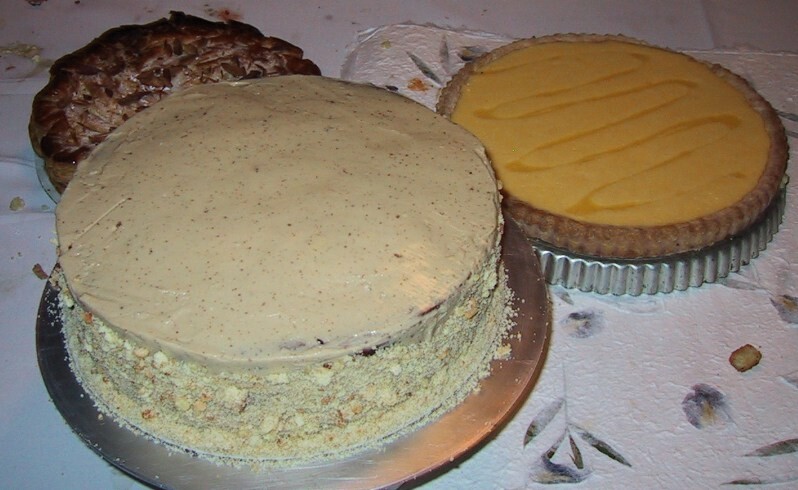 Here's a better picture of both a tart slice and the two fraternals next to one another. 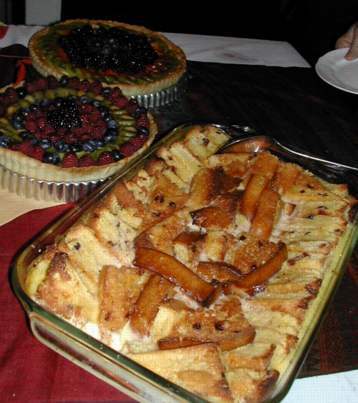 Cornbread pudding is common to see in soul-food places, usually with chocolate chips in it. I went with dried cranberries due to the season. William claimed it was thus "Amish Soul Food." I'm not a huge bread pudding fan myself, but cornbread has a nice texture that I like better than most. I enhanced that by first toasting the cornbread. The first set of mains consisted of things we could do either in the oven, or ahead of time. 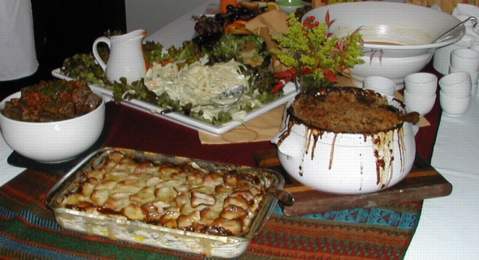 The gratin and cassoulet cooked in the oven while the fish courses were being worked on. The beef we made ahead and kept hot in a cooler along with the reduced sauce. We could have re-heated it if needed, but it was honestly warm enough without that. The potato gratin is a favorite of mine due to the simplicity of it. Just sliced potatoes, salt, pepper, and heavy cream to cover. Bake in a 350-375 degree oven until the potatoes are soft. Place a sheet pan under it in case the cream boils over. To make this version more fancy, we placed a layer of black truffles mid-way through the potatoes, and also hit the top with truffle oil pior to putting it on the table. I wrote about potatoes before. 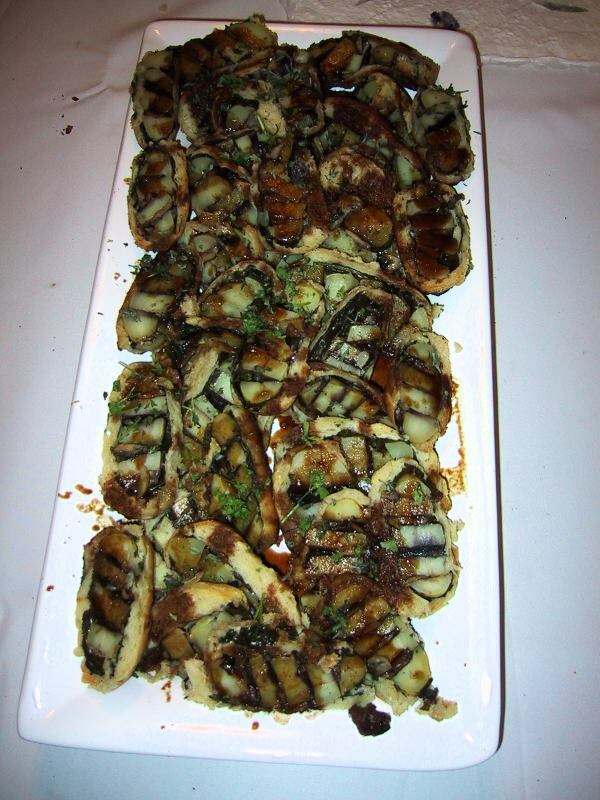 You can read about the mushroom "cassoulet" here. Vegetables pointy were asparagas tips and morel mushrooms, cooked in a white wine and dark vegetable stock. 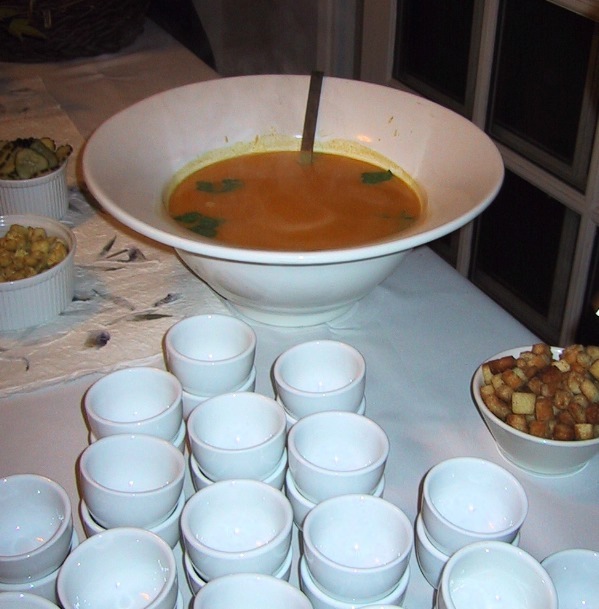 Vegetables round were turnips and carrots attacked with a melon baller and cooked in light vegetable stock, vermouth, and garnished with lemon thyme. This isn't much work for a dinner for two or four people, but for a party of this size, Derrick had lots of "fun" prepping all of the vegetables. The lamb was smoked at 350-375 in a smoker with lots of cherry wood chunks. Took it to around 120 degress internal temperature, let it rest for 15 minutes and then cut and served. 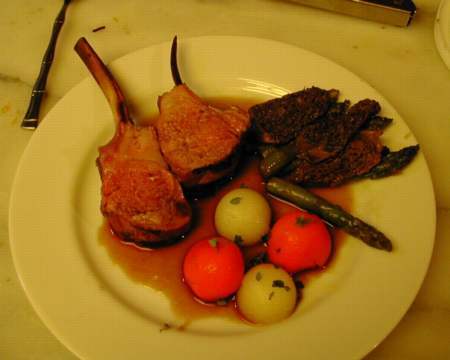 The sauce was a simple reduction of Pinor Noir, lamb trimmings, and oxtail stock. 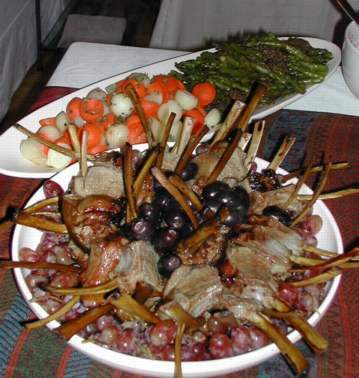 Note William's cool use of two kinds of grapes in the plating! Here's how I more normally serve this dish on a single plate. We didn't do any fancy plating for the party, but wanted to grab at least some things in case the guests inhaled everything before those of us in the kitchen could eat. This dinner was light on prep in that we easily got the setups ready well in advance of the guests. But as I theorized to the sous chefs, the cooking was going to turn intense. We had a large number of dishes that needed lots of burner time. Once again, I was impressed beyond measure with the help. The vision of the dishes was produced by hands other than my own. I can't even begin to describe what cooking with these folks is like. Gone in five minutes. Really. Several people were impressed by the idea, but the reality is that this is a new American Classic. I really just did a minor riff on it. However, we really did execute it very well. Not a single chef got to taste the completed dish -- it went that quickly. The scallops (really huge 12 count ones) were pan seared in clarified butter for 3 minutes or so until just cooked through. Around them, spinach cooked with shallots until wilted. The sauce, a flavored butter/cream sauce. The base of the sauce was reduced stock (I used a light chicken) and cream, to which whole/split vanilla beans and saffron were added. Then butter was whisked in and the resulting sauce poured into a thermos to keep for service. Beurre blanc type sauces keep in this manner for up to two hours, which really helps with the plating. 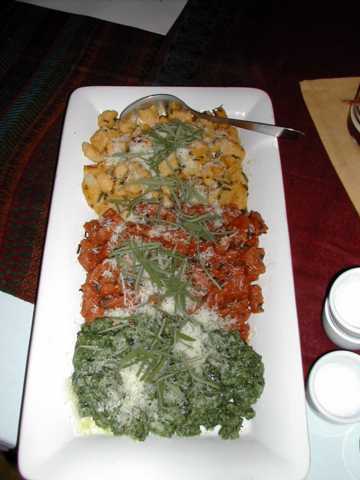 Three flavors: sun dried tomato, butternut squash, and spinach. These had been made a week before and frozen. 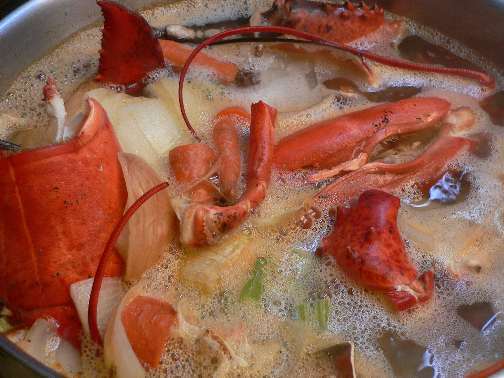 During prep we boiled them until they floated and then shocked them in ice water. Oiled and bagged into the fridge until ready for service. Each was pan-fried in clairified butter along with sage leaves. Plating was additional sage and parmasagn cheese. Pretty simple stuff, but they turned out quite well. Called "fiendishly clever" by a guest, this is another forray into what I call High/Low food. I take a traditional dish (in this case, Buffalo Chicken Wings) and recast it as something fancy. This was an idea brewing for the past three years, and twice I thought about doing it, and rejected the idea. Finally, I just went for it. Monkfish is an excellent fish for medium/pan frying. 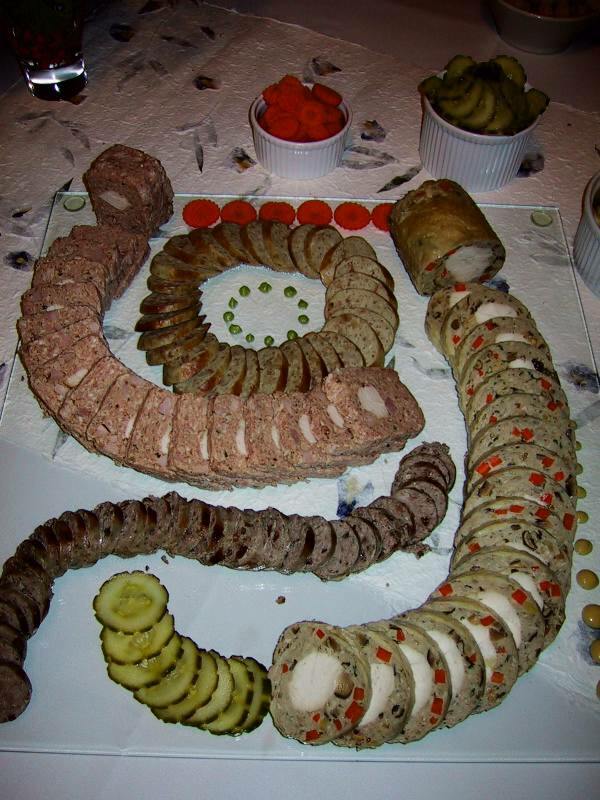 We first sliced the fish into "medallians" as one would a pork tenderloin. Just before cooking, we gave it a flour coating that contained ground poultry seasoning. 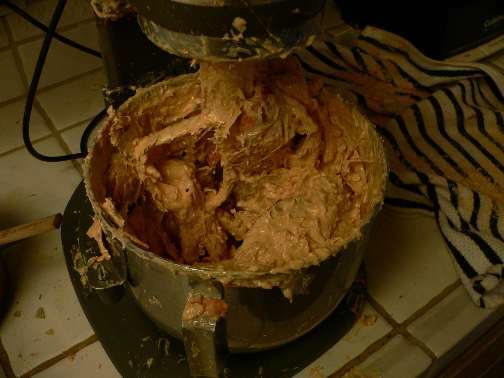 The sauce was a combination of Frank's Hot Sauce, tomato paste, and butter. 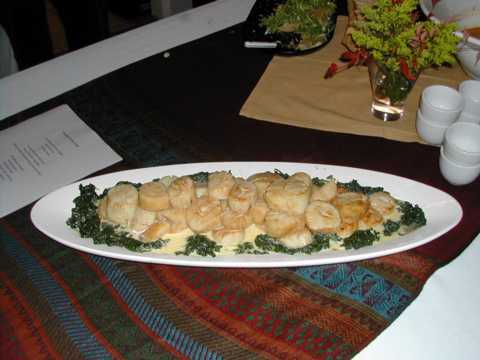 We mixed them in a beurre blanc fashion, and kept the heat level down in order to keep things "fancy." The tomato paste helped keep the color while not adding too much heat. We ran up the sauce ahead of time and placed it in a thermos to stay warm. The finished monkfish was tossed in a bit of the sauce, and the remainder of the sauce was served on the side. Since Buffalo Chicken Wings are traditionally served with blue cheese dressing and celery sticks, I used a varient of this. Celery root was shaved into 1/4 inch "noddles" and dressed in a remoulade sauce (oil, lemon, mustard) to which we added about a quarter of a pound of smashed Maytag Blue Cheese. 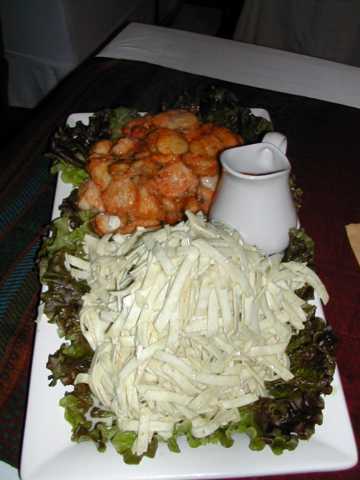 The salad was prepared several hours ahead -- this is a requirement in order for the celery root to "cook" in the lemon. For the plating, I kept it to the tradition and served everything on a bed of leaf lettuce. As one guest mentioned -- "I get the joke." But joke or not, this dish turned out amazing and I would easily make it again. 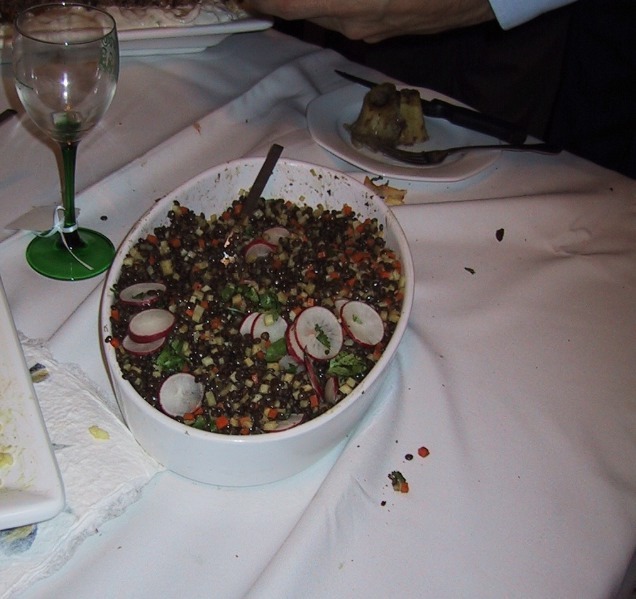 It was my worst fear going into the dinner, and also the most resounding success. The party was (as usual) an amazingly good time. I had three folks helping me out this year in the kitchen, William, Derrick, and Tim. And, as always, Carol did a stunning job with the decor. Every year, we get more and more organized, and I now instinctively trust everyone. A minimum of words and guidance are needed. 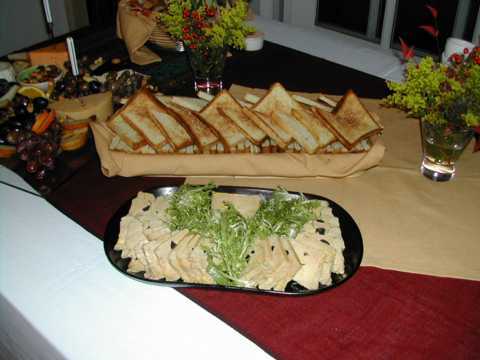 The party starts off slow and calm with the appetizers set out as the guests begin to arrive. Wine is poured. Chairs and tables found. Slowly plates and silverware begin to be pressed into service -- the madness is on! I can't recall all of the cheeses this year, but do remember one was "Roaring Fourties" (a blue from Tasmania) and another "Chimay Washed Rind Cheese." The fruit and cheese tray also featured Spicy Rosemary Mixed Nuts. The foie is my fairly standard terrine, studded with truffles. 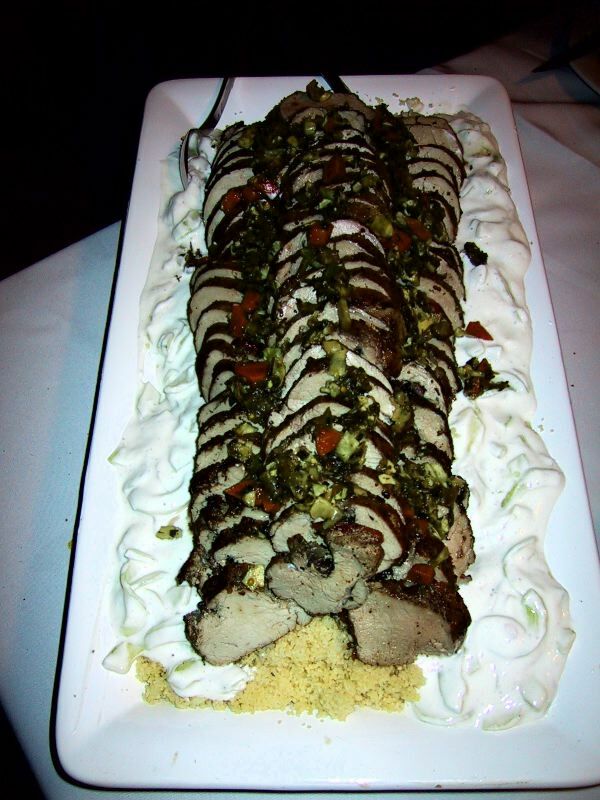 This year we served it with a frisee salad tossed in truffle oil, and toasted pain de mie. The supplier was Sonoma Foie Gras, which has been taking quite a bit of heat recently, so I figured I would support them. The Strawberry Salad was baby spinach, small dice of English Cucumber, vertically sliced strawberries, and matchsticks of jicama. 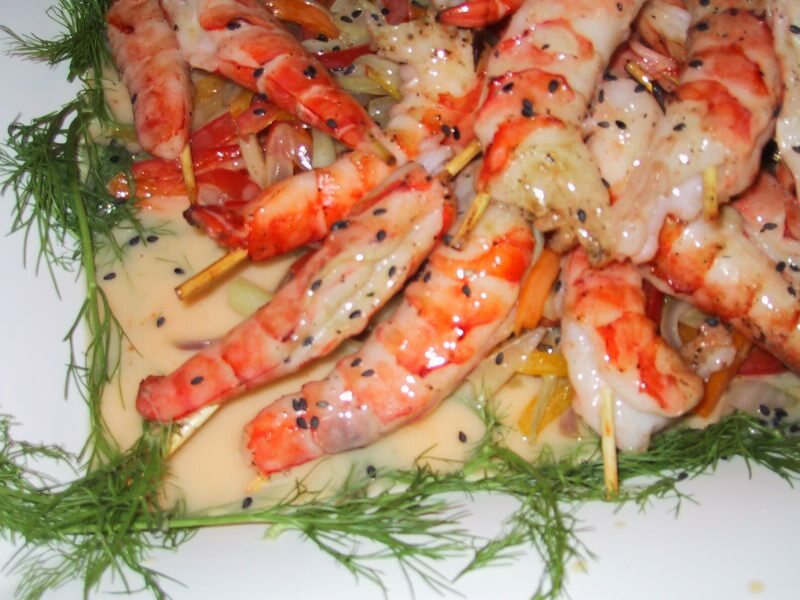 We tossed them all in a basic oil and lime vinegarette. This actually works best with strawberries that aren't super great and in season. I think that lame strawberries kind of taste like cucumber, which is why I included the cucumber. 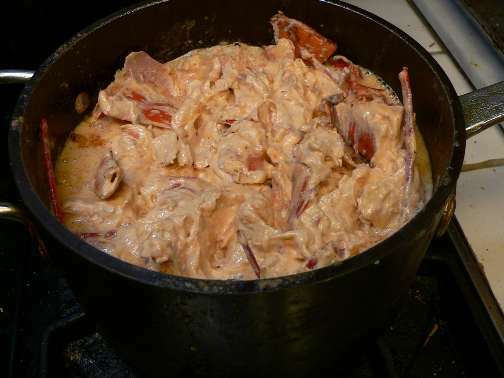 The crab bisque was mostly made the weekend before and frozen. I used Dungeness crabs because I'm on the west coast. Right before service we re-heated the soup and added heavy cream. We then whisked in the crab butter. Garnish was chervil leaves. 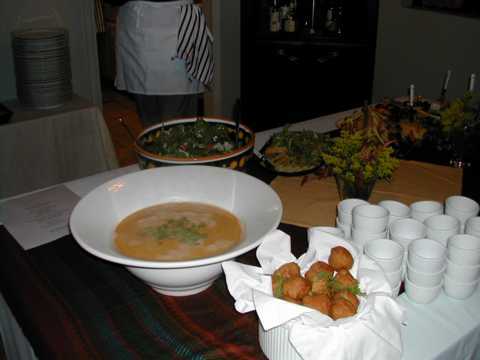 Along with the bisque we served savory beignets (a kind of doughnut) flavored with Old Bay seasoning (a seasoning blend popular with shellfish that has a heavy celery flavor). 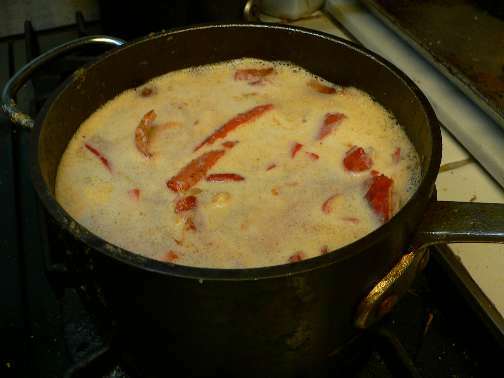 For the liquid we used Dixie beer, because both bisque and beignets are popular in New Orleans. ...and I'm grinnin' like a fool. The party was amazing. The guests. The help. Carol. The food. The wine. The complete lack of sleep for three days. More later, Homer sleep now. Okay, so here's the prep list, reordered based upon time. I honestly can't say anyone other than me cares, so my excuse is that I'm using this blog to back it up in case I delete it from my computer. This list is now taped to the cabinet in my kitchen, all ready for the big day. 14) WATCH SMOKER TIME AND TEMP, DO NOT CROSS OFF UNTIL LAMB IS OUT! Well, I've got together the menu, prep, and shopping lists for this year's big party. The first step for me is to list all of the items on the menu, breakdown the steps that go into them, and figure out what needs to be purchased (that I don't already have on hand). Each menu item has a number and the steps are numbered the same, so that when looking at the timeline view, I can tell which dish a particular step goes with. The next step is to re-order the items based upon a timeline and assign times to do each step. If you find this sort of thing interesting, go to the extended entry. Some folks at work were asking me about clairified butter a few weeks back after I admitted that I usually keep between one and two pounds of the stuff on my stove. Last night with Bravo re-runs of The West Wing playing, I figured I might as well make some more and write up how I go about it. At least it goes with the name of the blog. Clairified butter is butter which has had all of the water and milk solids removed. As a result, you can use it for high heat cooking without fear of burning. You traditionally also use it for emulsion sauces, although melted butter also works fine there and has a bit more flavor. Because it has had the water removed, it keeps well without refridgeration for several weeks (at least in my experience -- web searches turn up no solid information on this). I keep mine in a small 1 qt covered saucepan that has seen better days such that I don't care to cook much in it. I leave it on the back of the stove unless I need the room. I use the same pot for doing the actual clairifying. It's just big enough for about a pound and a half of butter without having a foam-over problem. To do this, melt 1 pound of butter. It can be either salted or unsalted -- salt is water soluble and thus you are going to remove it anyway. Since this butter is going to be a cooking medium rather than a main ingredient, I tend to use cheaper butter for this. Costco sells butter in 4 pound packs that I usually pick up for this purpose, freezing the unused blocks until again needed. After the butter is melted, turn the heat down to low or medium low. You want the water to actually boil off, so exact heat isn't important. You don't want it to be really high for two reasons: 1) the pot can foam over 2) the solids will eventually settle to the bottom of the pot where they can burn. I usually use a large soup laddle to stir the butter every once in a while in order to encourage the water to boil off. 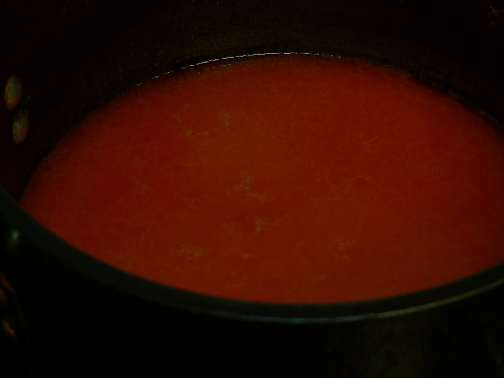 Once the water has fairly well cooked off, reduce the heat and allow the liquid to obviously settle into solids at the bottom and oil at the top. If there are bit of foam at the top, spoon these off. 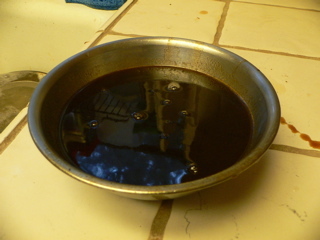 Pour off the oil into another container and remove the solids, any remaining water, and what's left of the oil from the pot. Wash the pot with water and dry. Pour the oil back into the pot, taking care not to catch any stray solids you may have missed in the first pour-off. Done. You can either discard the milk solids, or if you have been careful not to allow them to brown and are thrify, can make use of them. 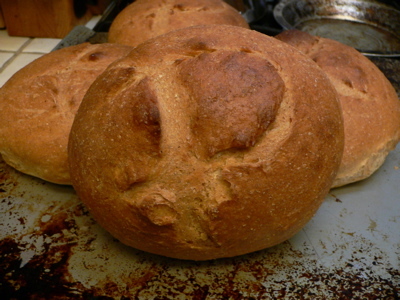 They make a nice addition to bread recipies that already call for oil, butter, or milk. Two weekends ago I added them to a Rosemary/Olive loaf that I'd put about 1/2 C of whole wheat flour into. The butter solids helped to soften and tone down the whole wheat just enough. 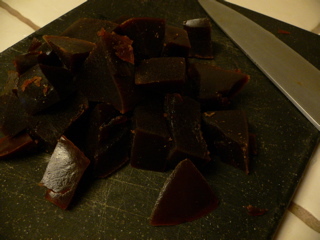 I did a batch of Gulub Jamun today as a test. It appears that the correct fry temperature is quite low -- about 300-325 in order to keep them cooking for 5 minutes without burning. I also tested adding cocoa to the mix, and it appears that an addition of an equal amount of cocoa to flour is about right. The mix didn't get too dry as a result and had a nice chocolate taste. I'm also pretty impressed with the recipe as a whole. It seems quite easy and forgiving. I've been taste-testing them without the sugar syrup, but will add that in next weekend. 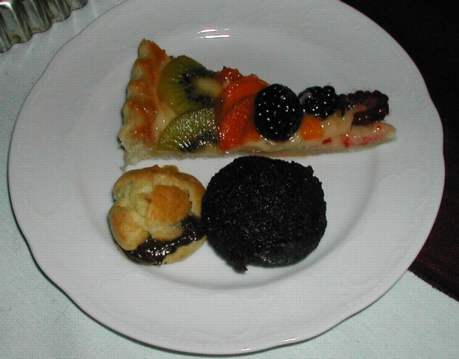 William and I discussed this desert and we sort of thought about doing a second dish to parallel the Gulub Jamun. 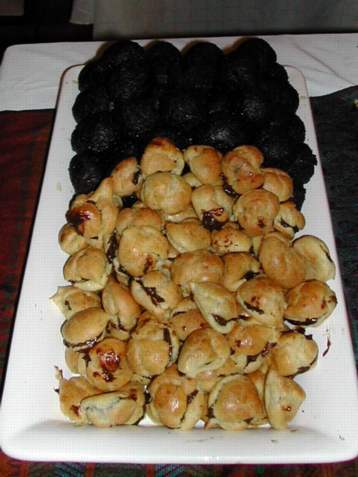 My thought is a Rosemary flavored cream puff stuffed with a very rich dark chocolate mousse. I'm thinking of calling it "Rosemary-Chocolate Fraternals" because they are twins in ingredients and shape, but not really in production. So far, looks pretty interesting. About a week ago I picked up a half gallon of "Manufacturing Cream" from Smart & Final. This appears to be a "unique to West Coast" item as when I asked chef-instructors at the CIA about it, they hadn't heard of it. The attributes of it are: higher in butterfat than most heavy cream, and no additional ingredients. Most heavy cream has stablizers in it, which can make for less than ideal chocolate truffles and whipping behavior. So I'm Told. I've never myself had any problems in these areas. In any case, I've got quite a bit of very heavy cream in the fridge now. So last night I made a quick chicken stew in heavy cream. I cut up a really nice and small chicken I managed to find into four pieces. A quick browning in clarified butter. Then fine minced onion and sliced mushrooms. Some white wine, chicken stock, and thyme. I then returned the chicken to the pan, covered, and simmered for about 10 minutes. Removed the chicken, reduced the sauce and then added about a cup and a half of heavy cream. Reduced this again to thicken. Served the whole thing over noodles. On Saturday it was stock making time. 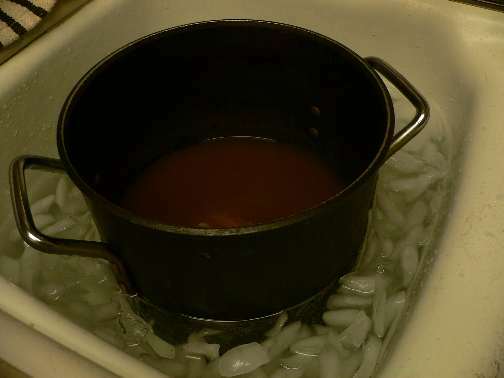 I was almost out of all of my frozen stock, and Carol wanted to learn how to make stock -- so, off to the store we went for supplies and several hours of simmering. Stock is such an important part of French cooking that I'm not sure what I'd do without it. 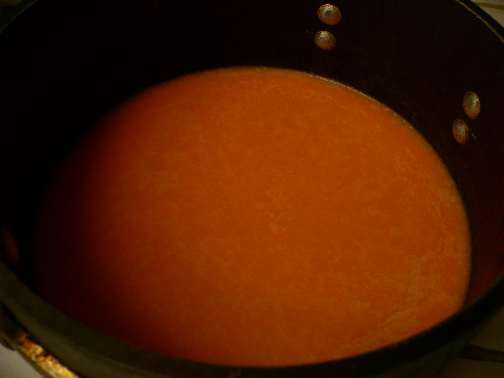 Homemade stock is always preferable to canned (which has far too much salt in it), although you can get by with canned stock for lots of applications. 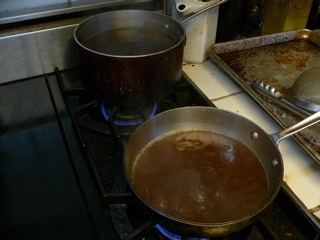 There is one exception -- brown beef stock can basically only be made at home. 1) For Brown stock, brown the main ingredient well in a 400 degree oven (about an hour). For Light stock, blanch in boiling water, drain, rinse. 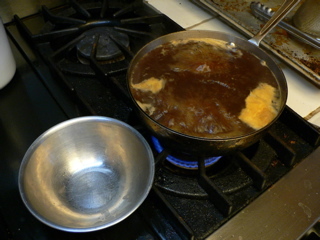 3) For Brown stock, brown the vegetables in the same pan you used for the meat. At the end of browning, add tomato paste, brown that as well. 6) Strain. Cool. Remove solidified grease from top. Freeze in ice cube trays. A - you can use other vegetables. For white stock, sometimes people use parsnips instead of carrots. B - Generally speaking, you don't want to get carried away with flavorings because you never know what you'll use the stock for. Some would argue that even including thyme/bay leaf counts as flavoring. So, you can leave these out if you wish. C - Normal recipes call for wrapping in cheesecloth. 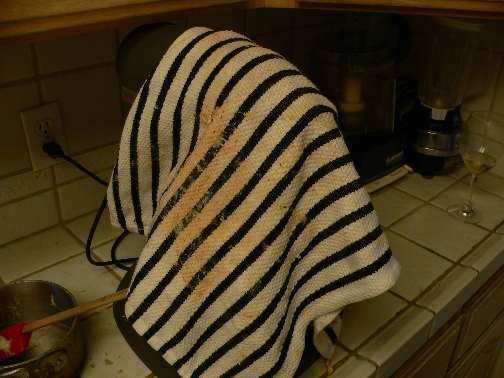 I use a coffee filter, which is much cheaper and easier to come by in most kitchens. D - Acid helps clairification. If you have some sort of produce with acid in it, the stock tends to self-clairify a bit. E - Don't boil too strongly. A slow simmer is best. F - 1-2 hours for vegetable and fish stocks. 3-4 for smallish bones like poultry. 5-6 medium bones like veal or oxtails. 10-12 for thick knuckle bones. 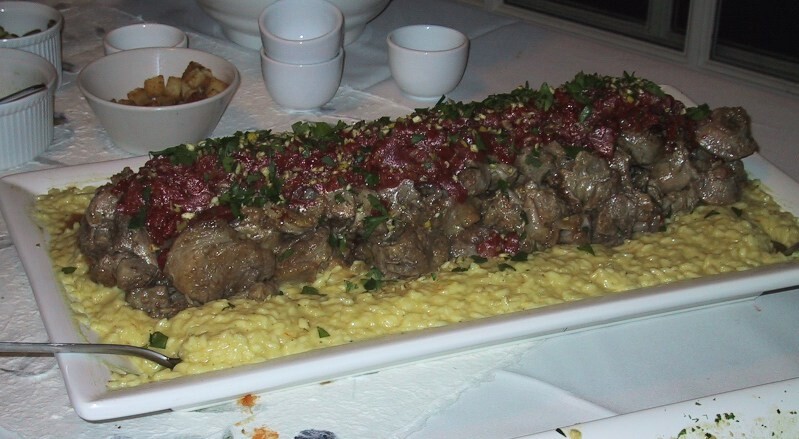 We used oxtails for our beef stock, which are very flavorful and heavy with gelatin. As a result, we didn't need to use a full 1:1 weight ratio. For our chicken stock, we used chicken wings which also make a very heavy stock. We used standard vegetables and flavorings, as I wanted to show Carol the basics. After the oxtail stock was done and strained, I ran a 2nd stock from the same ingredients. This is known as remouage or "re-wetting" in French. The resulting stock is weaker. However, I take this second stock and reduce it down to about 2 cups. 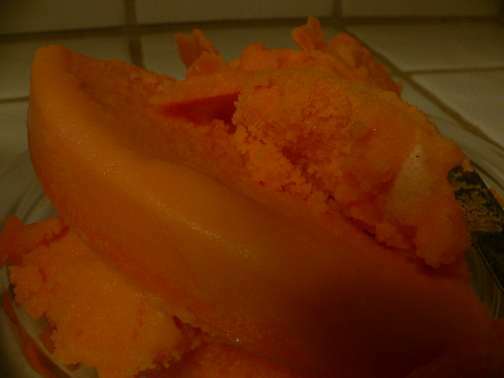 This results in a very heavy beef glace which can be used for enriching sauces. It is incredibly thick and rich and sticky -- and you can't buy it anyplace. Plus, you just got two produces for the price of one! 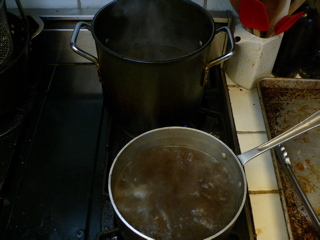 Our pork stock was browned in a pot (because we had such a small amount of meat we were using). Also, I went ahead and flavored the stock with garlic and rosemary. This is because this tiny amount of stock had one purpose only -- a BBQ sauce the next day. This non-traditional stock was a nice change from the more "boring" other ones we were making. All in all, it was very successful!